We study the relation between credit conditions, misallocation of resources, and productivity growth in a multi-sector model with financial frictions. 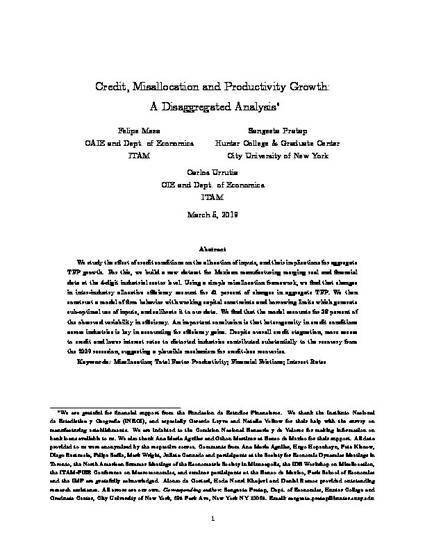 In our framework, working capital constraints and borrowing limits create wedges between the marginal product of inputs and their relative prices, which we can map into distortions to the capital to labor ratio and to the use of intermediate goods. The distribution of these distortions across sectors and their changes over time affect aggregate TFP. We construct a novel dataset for the Mexican manufacturing activity that merges real and financial data at the 4-digit sectoral level and use our model to account for aggregate (manufacturing) TFP growth. The calibrated model explains a large fraction of observed TFP growth between 2003-2012, with sector specific credit conditions playing a significant role. In particular, the contribution of changes in interest rates varies from 23 percent to 88 percent of the model predicted TFP growth in dfferent subperiods. Sectoral heterogeneity in credit conditions, measured directly from the data, matters crucially for our results.